Not-so-secret-guilty-pleasure alert: I love mini eggs. The kind of love that requires mini eggs to be hidden if they enter my home, lest they be consumed in one sugar-filled sitting. During Easters of yore, I would hit up Bulk Barn for all my mini egg needs (need being the operative word, here). But recently I’ve made a more wonderful discovery: Mini eggs are part of the local culinary scene this time of year - at least at coffee shops and bakeries. 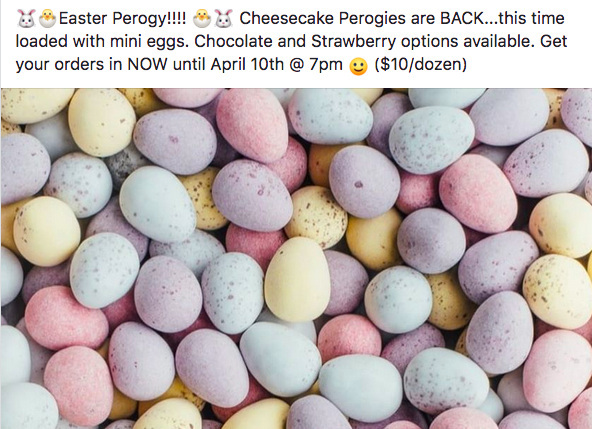 I’m talking about mini egg hot chocolates, mini egg donuts, and even *gasp* mini egg perogies. Read on, my dear fellow Okanaganites… And - you’re welcome! 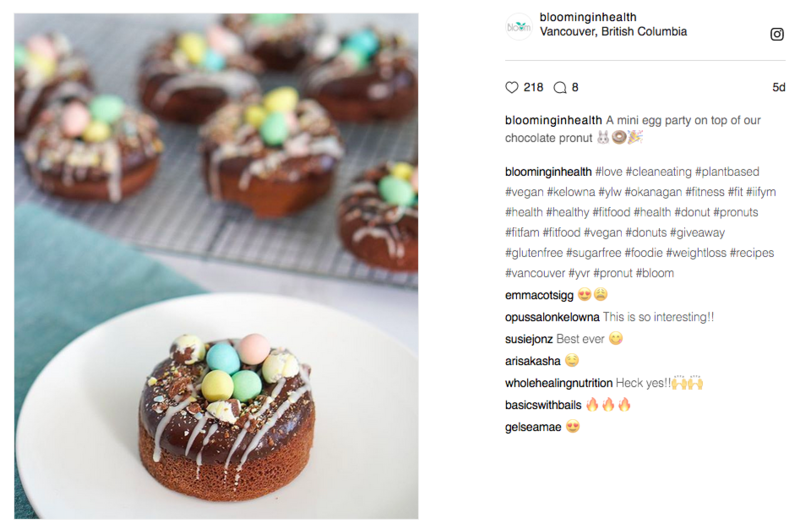 Blooming in Health makes gluten-free, stevia-sweetened and high-protein treats (with vegan options), and their “pronut” looks amazing! Visit their site for all their Kelowna area retail locations here. Bin 4 Burger Lounge is selling a whipped mini egg cheesecake, topped with crushed mini eggs and graham crust for $7. Sign me up! Kootenay Coffee Company is serving up a Mini Egg Mocha with whipped cream and mini eggs. 12 ounce: $4.50, and 16 ounce: $5. Ratio Coffee and Pastry in Vernon has mini egg donuts. YES PLEASE! Shut the front door - mini egg perogis are a real thing, and all I can think is what a time to be alive. $10 for 12 perogies, but orders close April 10. Bonus: Some of gluten-free options available. Where: Visit her Facebook page here for more details. Whisk Cake Company in Rutland is your go-to spot for mini egg treats like mini egg macarons, mini egg brownies, mini egg bouchons. 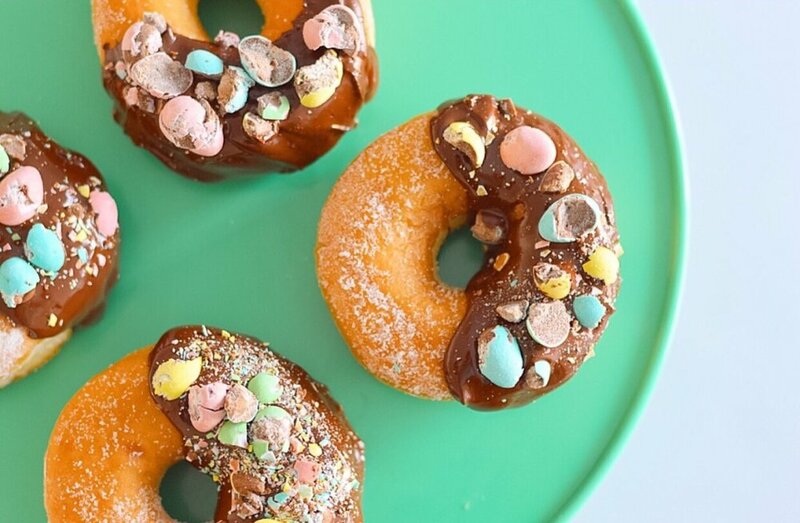 Aaaaand, if all else fails, hit up your local Tim Horton’s for a mini egg donut. Happy Easter!! 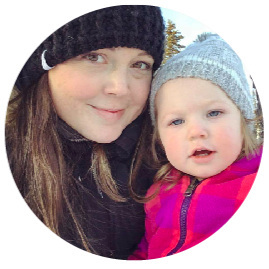 Kristen Thompson is a freelance journalist, and half of the team that makes up Do The Okanagan. She has a sweet tooth that she tries to keep in check 11 months out of the year. During Mini Egg season, however, all bets are off.